After the successful installation of a previous machine, a major US battery manufacturer contracted Kinesys Automation to design and develop the 'second generation' system of a work cell to load battery terminals into a molding machine, and remove finished battery lids from the molding machines and deliver them to an operator for secondary operations and subsequent palletizing. The system includes a robot equipped with a custom gripper that selectively picks a negative or positive terminal each oriented by a dedicated feeder bowl, and places the terminal into one of eight nests on a pair of pallets. Each pallet is independently controlled and positioned by a pneumatically actuated slide. Once a pallet is loaded with the approprioate terminals, it is transported to a position accessible by a dedicated overhead cartesian robot that picks the leads and loads them into its respective injection molding machine. 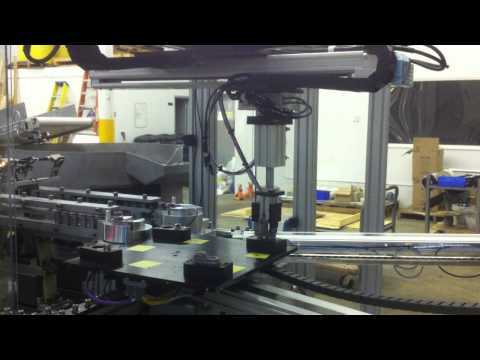 Prior to the cartesian robot returning, it first removes the completed lid from the opposite face of the molding machine and delivers the finished part to a dedicated conveyor. For shorter runs, the system further includes a manual loading station, allowing the operator to load 32 terminals onto a single slide from which the robot can pick and place the terminals into the one of eight nests. This results in an operation that allows the work cell to service different families of battery terminals on each of the two molding machine it supports.